Old style Power supply cables are equipped with little floats. New cables have instead of floats, a buoyant foam jacket. The wire often breaks somewhere between the handle and the motor and is repairable by cutting at the handle and stripping back the insulation and crimping new terminal connectors to the ends. This will shorten the cable by about 1 foot. A continuity tester found on most multimeters, will locate the broken wire. Sometimes water in the terminal well corrodes the connectors/wires on both power cord and pump causing all four wires to break. Check the pump wires while replacing the cord. WHITE is the short wire connecting to the first terminal post. BROWN wire connects closest to the pump motor. TOOLS: Philips and slotted screwdrivers. Small socket or nut driver set. As repairs go, this can be very easy or a pain. Remove the cable clamps from the handle and body. Turn the machine upside down, remove the filter bag and filter screen. Locate the terminal cover and remove the screw. You may have to pry the cover out of the putty. Scrape the putty from the terminals with the slotted screwdriver. SAVE THE PUTTY. It is electrical putty. Use a nut driver to remove the terminal nuts. Attach string or flexible wire to the round connectors on the cable, pull the cable out of the housing and remove the string/wire. Reattach the string/wire to the new power cable and slowly pull the cable thru the body. Reattach the cable connectors to the terminals, tighten the nuts. Repack the terminal well with the saved putty and screw down the terminal cover. Install the filter screen, filter bag and re-clamp the cable to the handle and body. 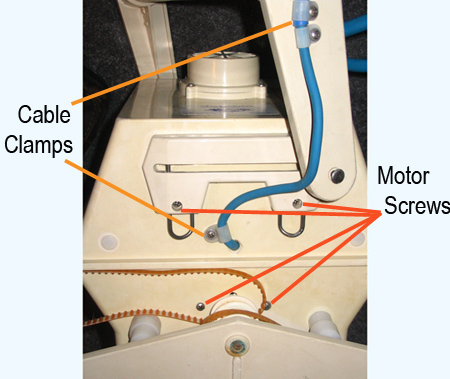 loosen the 2 or 4 screws that anchor the motor. This will give enough wiggle space to move the cord out and in. DO NOT remove the screws unless you wish to remove the motor. BONUS A visitor recommends splicing the plug end from a computer power cord, in his case a printer cable, to a robot cable with a plug in need of repair.